What I present below is a small project that I could not post on time this Halloween, due to what happened with the Brassgoggles server. So belatedly, I present a simple build that is meant to be more culturally informative and MUCH less about the build itself, and while dealing with spirituality it's NOT meant to be a subject of religion, specifically (Moderators: Please feel free to advise me if improper or improperly placed). For those of you who haven't heard about this, the Day of the Dead ("Dia de los Muertos") is originally a Mesoamerican (including Aztec) ritual wherein you build an altar dedicated to the dearly departed, perhaps a family member or a loved one. The original belief is that you could "commune with the dead" by leaving food items (usually the favorite foods of the departed one), and that the spirit of the departed person would "consume" the food, at least in spirit. The altar will naturally have a picture of the deceased, religious symbols, and some favorite items related to the life of the diseased, or toys (for a child). Some traditional food items could be found, such as "Bread of the Dead," and a type of orange-coloured flowers known to the Aztec since pre-hispanic times, the Cempazuchitl flowers (Mexican Marigolds), which are placed all around the altar (yeah I know, I didn't use marigolds but this is as close as I could get!). During the conquest, the Catholic priests incorporated the pagan ritual into religious dates, the Day of All Saints Day (Nov 1) and All Souls’ Day (Nov 2), in the hope that the natives would abandon their pagan faith and rituals. The practice of visits to the cemetery by family members, and Catholic rituals were incorporated into the Nov. 1 and Nov. 2 dates. Traditional breads and foodstuffs usually surround the celebrations, and it is customary to give the children (both living and deceased!) tiny decorated sugar skulls, as well as leaving sugar skulls on the altar with the name of a diseased child written on the skull. The atmosphere around these dates is not somber, but rather one of celebration, and often making fun of death, not entirely unlike the British/American tradition of Halloween, but with much less or almost no emphasis on the horror lore that we are accustomed to. After all, this is a communion with the dead, you are not trying to scare them away! Papier mache figurines depicting dressed skeletons "in daily life" are typical, and students make fun of their teachers by writing mock obituaries for their teachers or co-workers, writing prose or poems which English speakers would qualify as a type of "roast," or satire about their peers. 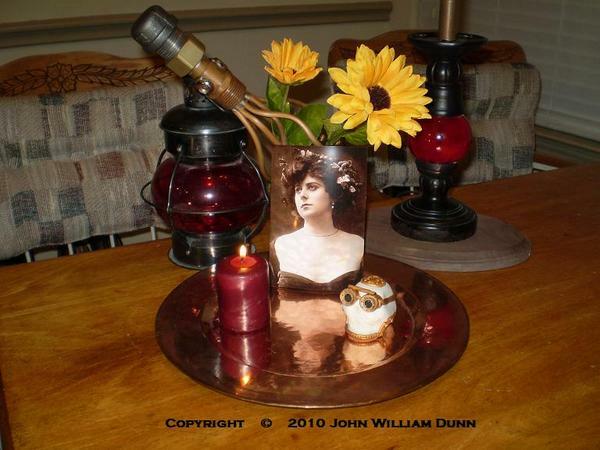 My version of the Steampunk Altar has a cross made of pipes, the portrait of an Edwardian-Era actress, Miss Gaynor Rowlands, one of my copper "Crowned Pigmy Kraken" specimens (why not? Maybe Ms. Rowlands' pet! 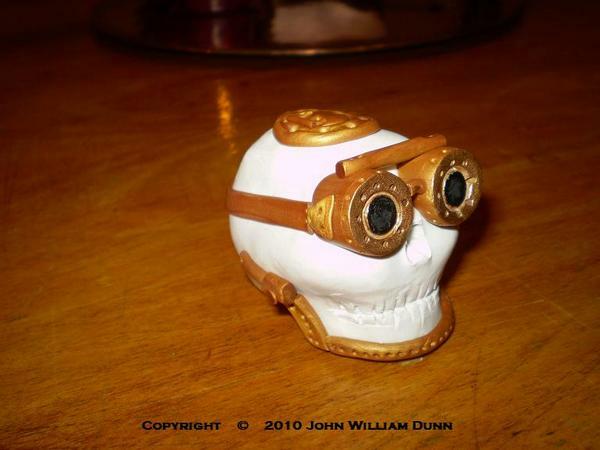 ), an oil lamp with a red-blown-glass shade, and a sugar skull with goggles of course! 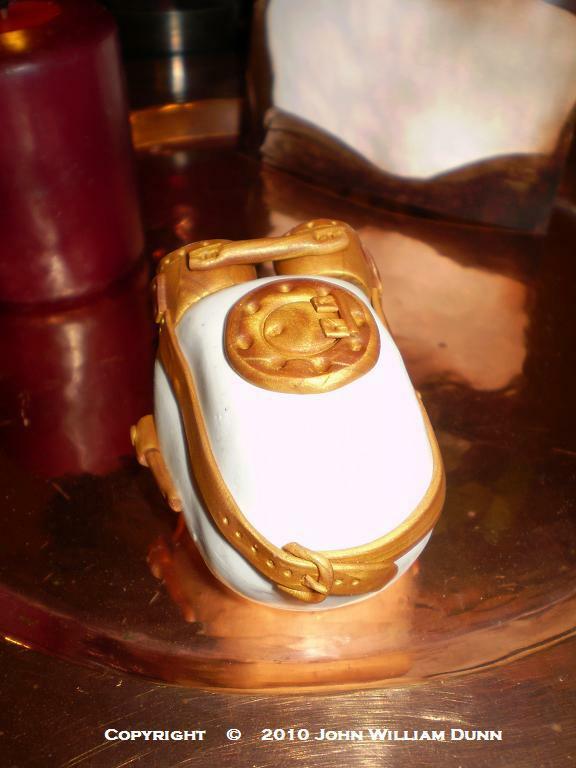 (actually made in Sculpey / Fimo). All of it over a hammered copper plate. The skull features a mechanical "mandible replacement," and a "cranial porthole" (from a lobotomy? 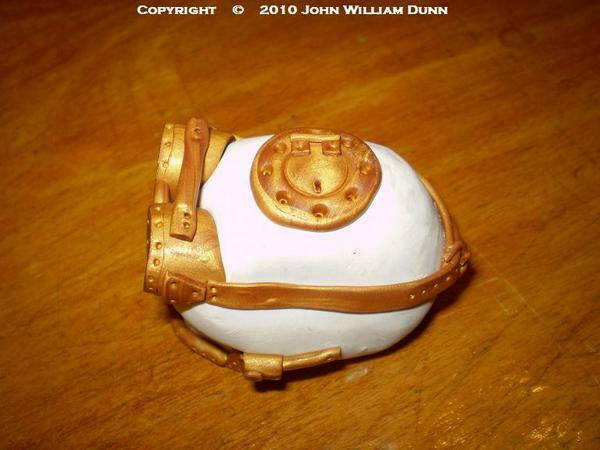 ), no doubt the result of a hard life aboard an airship. Naturally the skull is not anatomically correct as it is meant to represent a sugar skull, but frankly I found it much harder to make in real sugar and meringue, the traditional materials of choice. So if the crew aboard an airship were to erect an altar, what would be the necessary elements? Perhaps coal on the lower level representing the earthen world, and a boiler, open to receive the coal to be transformed by humanity? Could the smokestack represent the ascension of the human spirit to the heavens? Would there be an "aetheric spirit receptor" present (Will Rockwell: "wink, "wink"), perhaps something like a distiller to "condense" the etherized essence of the spirits? He, he! So I leave you to peruse these images and ponder these questions I raise... and I hope you had a Happy Halloween and Day of the Dead! Well, being a novice at it, I found it nearly impossible to form the skulls in sugar mixed with meringue. I made a fist-sized one and it kept "melting" on me, until I put it in the refrigerator to dissicate. It ended up looking like an "Aliens" skull. Ha! Ha! I'd show you, but my grandfather found it and ate it in one sitting! I've been considering doing some sort of ancestor shrine around Halloween/Samhain before, and you just gave me some really great ideas. Samhain, Day of the Dead, and Mayan Horology? The Gaels believed that the border between this world and the otherworld became thin on Samhain; because so many animals and plants were dying, it thus allowed the dead to reach back through the veil that separated them from the living. It seems that even though great emphasis is placed on separating the two holidays, from the point of view of the ancients, similar ideas existed in two separate parts of the world. Of course, we don't know exactly when the original Mesoamerican rituals happened (as the Spanish friars were very thorough in the elimination of almost any vestiges), but it wouldn't surprise me if the date was close to the end of October. It was just the Catholic church compaginating the dates. The common denominator between Samhain and the Day of the Dead is the breaking down of the barriers between the physical and the spirit worlds. In fact, you could connect the three levels of the universe (Heavens Earth and the Underworld) in various ways; The Milky Way itself was related to a type of "Tree of Life" whose roots were in the underworld and its branches were in the heavens. As the earth rotated so did the "tree." And the planetary motions were in fact re-enactments of actions by the gods in the Mayan pantheon. Hence like other ancient peoples, they became obsessed with studying the movements of the celestial bodies. The Mayans became obsessed with time as a means of predicting the stellar movements. From that, came the 20-base number system including the mathematical concept of Zero, and a calendar that (by way of the 20-base) is more accurate than our own Julian and Gregorian calendars. So I wonder... if the Classic Maya had not succumbed Circa 1000 AD, would they have become a "Clockwork Culture?" Steampunk by way of Horology perhaps? What would a "foreign" culture, isolated from the rest of the world evolve into by the time that the industrial revolution arrived? I don't know if it was intentional, but the look is decidedly Mayan, or at least Mayan-inspired, and by the title, it does suggest a clockwork deity of some sort. I've never really considered a steampunk concept that wasn't influenced in some way by European culture. That's going to take some thinking. I also was not familiar with that information about Mesoamerican cultures. Thank you! I did know that the Catholic church set up All Saint's Day (November 1st) and All Souls day (Nov 2nd), to directly compete with pagan practice in the Middle Ages. The idea of it having meshed with local practices would explain a lot about the vibrant color and culture tied to Dia de los Muertos. If I was to do this, I would almost certainly wimp out on the sugar-skull making part—I think I can find plain ones around here in October without too much effort, given the many generations of Mexican-Americans in these parts. You can order them over the Internet: http://www.mexgrocer.com/10069-5.html But these are really ugly. I wonder if they sell "blank ones" ? Use some gold-coloured decorations on top? I was very surprised to see some appeal towards the Day of the Dead cross the pond, so to speak... Do you have any steam-positive plans for these days at the end of October / start of November?? The closest to Steampunk I will have on mine is my mom and I in Civil War era garb. I'm not sure how I'm setting it up this year, I did some "shopping" while I was in New Orleans. Thoroughly enjoyed the read - LOVE the altar. and would love to see what you add this year. rather than European in origin and moving ...east. but it's an interesting concept isn't it? Thank you for your kind words, Ms. Dwyer! I firmly believe more people need active (interactive?) altars in their homes. In Mexico, unfortunately the tradition of having an altar depends on your socio-economic status, with the higher classes exhibiting a much lower rate of observance of the holiday traditions; so even in Mexico, observance is not uniform. Historically, rural people tend to be ethnically more Native Mesoamerican (30% of net population in that country is classified as 90% Native or better), and it falls onto them to follow those traditions. To see a good example of these traditions it's best to go to small towns and rural areas (although college students, I was told by another forum member, do hold competitions in Mexico City to see which college can build the best altar). I also recall that subject matter on the "alternate Americas." It's a difficult topic to write about without politicizing the subject, and violating some "anthropological" factors. After much reflection I came to the conclusion, that developmentally, the peak of the Maya roughly was analogous to the Minoan culture, and politically they were feudal in nature more akin to city states in Medieval Europe. When the Classic Maya disappeared, a completely different order was established, and the Aztecs (at the time of the Conquest), followed a system most analogous to the expansionist Roman Empire, so most "alternate Americas" in Steampunk literature seem to be more viable in the Aztec context; although the Maya are far more "romantic" and "technologically attractive" in my opinion. To develop a clockwork culture, you would need a scientific obsession more akin to that of the Maya. The "Day of the Dead" as adapted by the catholic church is more contemporary to the Aztec, and is prevalent among the rural peoples of Central Mexico. So a pretty healthy expansion in the last few years among the English speaking peoples... The time is ripe for the arts and crafts in the US and the EU to get into a Steampunk version of the "Day of the Dead:"
and violating some "anthropological" factors. All the more fun, IMO. LOL! Well yes, I guess you're right it might be fun; in which case you're talking about Uchronism (ill defined alternate time-line but well defined location) and not Anachronism (well defined alternate timeline and well defined geographical location). Depends how crazy you want to get. A Uchronism would be Conan the Barbarian, which was written specifically and on-purpose, as an ill-defined period (upper neolithic -maybe early bronze age) to avoid making sense with European history. The problem is making the story believable, even if its very disconnected from reality. Re: Samhain, Day of the Dead, and Mayan Horology? 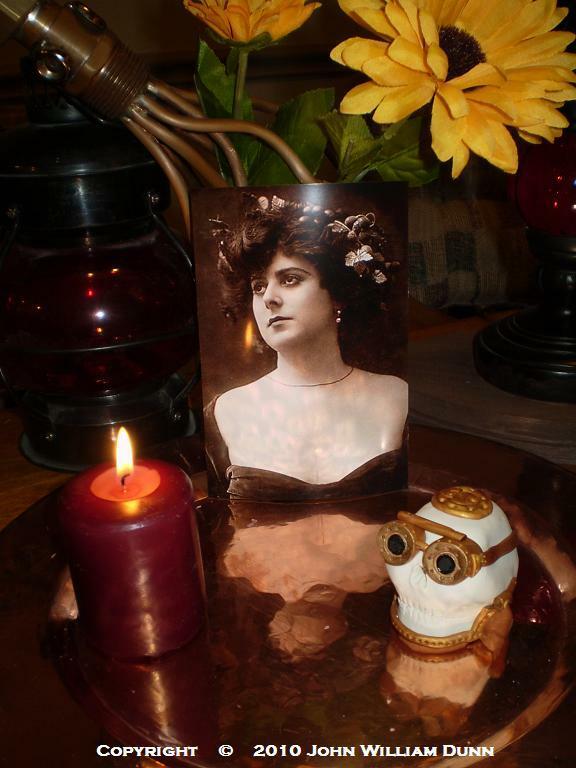 I love the beautiful lady in your picture and the cool mechanical squid! And on the link you shared above, all I can say is WOW!!!! Alright, joking aside. I've been waiting awhile to set anything up just given the status of my religious beliefs in the eyes of the family I wanted to make sure they weren't coming over any time soon. As I always say I am "Catholic*" and I didn't go down to New Orleans this summer to eat pralines. My mom and I both spent way too much time in St. Louis #1 and visiting shops of various kinds and needless to say it followed us back. Ha, ha! Good show Mr. Oakes! And it looks like you are starting to do what Craig Ferguson is doing for his night show! From what I remember besides the large altars it is customary to do smaller "personal" altars a the home of the family (sort of like what you and I did). As far as religious beliefs, I guess if the Catholic church can live with it... what's the problem? Odd that this kind of "folding" of pagan beliefs and acceptance took place at the same time of the Inquisition (but let's not talk religion in this forum, for that is violating the local rules). Anyhow, excellent effort. Mr. Oakes! Oddly enough, not a peep on the subject in the Mexican forum (except my resurrected post). Sometimes keeping folkloric traditions is hard when faced with the onslaught of civilization (everyone in the forum has a smartphone). It is now becoming an academic subject, with teachers at schools promoting the holiday so as not to lose it in the sands of time to the more commercial Halloween aspect of these dates. Yes, Mr. Brewer, that image caught my attention. I've been trying somewhat unsuccessfully to bring about a Mayan Clockpunk concept. For some reason the website is down today or the picture has been taken off-line, though (its a really old illustration - I have a copy of it but I can't re-publish without the author's permission. What is really surprising on the Day of the Dead, is how successful the exportation of the concept was (much more than last year), and how little I've heard of it in the Mexican forums this year. If were not careful, English speakers will start celebrating the Day of the Dead while the Mexican people will forget about the darn date! Yes, three days. As an anecdote, and from my memory, "trick or treating" takes three long days down in Mexico City. Because of poverty and the larger number of poor children out of school, you can see the Halloween part of going door to door asking for candy being somewhat popular, especially when going to the upper class neighborhoods. The problem is when the kids say "trick" they mean it. Should your car be in the driveway unattended, you may find it without a mirror hubcaps or scratched out the next day! I hereby resuscitate this old thread through the use of my evil powers of necromancy. As the Internet resources become more popular in Latin America, you can see that the medium lends itself for the diffusion of culture around the globe. There is a very nice group of articles on the Day of the Dead prepared by Yahoo News-Mexico. I haven't read it all, but I'll provide a link and as I start reading all of it, I'll discuss various issues here.... Just visually it looks like a very interesting site. This is an excellent gallery of pictures regarding the rural traditions followed during these holidays. You can see the progression from the altar building through to the visit of the cemetary by family members, and the Catholic mass praying for the souls of the departed. As I had steted before these traditions are more closely followed by rural people and/or more strongly the higher percentage of Native Mesoamerican blood among the participants. It's that time of the year again! I must apologize for not writing something original this year. I'm busy trying to restart my art business for the season. And my meager employment keeps me from researching on esoteric subjects. Anyhow Happy All Hallow Tide and Day of the Dead! Feel free to participate in the the thread! Day of the Dead (Spanish: Día de Muertos) is a Mexican holiday celebrated throughout Mexico, in particular the Central and South regions, and acknowledged around the world in other cultures. The holiday focuses on gatherings of family and friends to pray for and remember friends and family members who have died, and help support their spiritual journey. In 2008 the tradition was inscribed in the Representative List of the Intangible Cultural Heritage of Humanity by UNESCO. The holiday is sometimes called Día de los Muertos in Anglophone countries, a back-translation of its original name, Día de Muertos. It is particularly celebrated in Mexico where the day is a public holiday. Prior to Spanish colonization in the 16th century, the celebration took place at the beginning of summer. It was moved to October 31, November 1 and November 2 to coincide with the Western Christian triduum of Allhallowtide: All Saints' Eve, All Saints' Day, and All Souls' Day. Traditions connected with the holiday include building private altars called ofrendas, honoring the deceased using sugar skulls, marigolds, and the favorite foods and beverages of the departed, and visiting graves with these as gifts. Visitors also leave possessions of the deceased at the graves. I missed this thread on its previous go 'rounds, so thanks for the (seasonally appropriate) necromancy. When my father died I began leaving food items at the gravesite on November 1, because I think it's an excellent tradition. Once Mom passed, I added things for her, too. No candles, for risk of fire, and I can't stay out there very long in the evening because of the mosquitos. If any of the first three days of November occur during the school week in a year, I spend part of the class explaining the significance of the ofrenda, the pan de muerto, the calaveras, etc., even the Monarch butterflies (I teach Texas History, which has significant Mexican heritage). Of note is the observation you mentioned earlier that it seems to be a dying tradition with modern families corresponds with my own observations, as about half my native Spanish speaking students have families that observe the tradition, while the other half doesn't. I've been warned that due to the high humidity of much of Texas making one's own sugar skulls is a bit like Sisyphus and his rock. However, if they're not for eating, you can find inexpensive ceramic/pottery ones in some craft stores which you can then paint with your own design. I do like the idea of Steampunking ofrendas; it would certainly be a staple among the crews of el Corps de Aéronauticál de la República de México. HEB supermarket was full of Bread of the Dead" loafs yesterday, but apparently someone came and bought all of them. By today there was none. If I go by his favourite foods, then it'd have to be anything sweet, because he had an enormous sweet tooth. I did try to make the sugra skulls once, but they wouldn't set, as they're basically nothing more than egg whites and sugar. They deformed, and I attempted to save them, by putting them in the freezer. But my grandfather found them without my knowledge and them! That is why I switched to using sSulpey to make that skull in the first post of the thread. basically his sister, my grand-aunt, back circa 1990 found his teddy bear from when he was a child in Mexico City - in the 1930's in a box in San Diego - the bear was stuffed with sawdust and half rotten. When his sister threw away the bear, my grandfather, already 70 years old by then, complained. As a response, my grandmother bought him a teddy bear at the Price Club (like Sam's Club supermarket warehouse). One day I came back to my apartment from community college, like i did every afternoon, and shortly thereafter my grandmother knocked the door holding the bear in her arms like a baby. "Isn't he gorgeous"? She asked. "It holds like a real baby." Needless to say, I though she had flipped her top. So she explained to me the story above. Thereafter the bear became sort of a mascot and a source of running jokes for the family. I'm glad this thread was revived! What a splendid kraken! El Día de los muertos is celebrated in Madrid, thanks to the Mexican embassy and the Instituto Cervantes. You'll see this group has even planned to have tea duelling, inspired by our example in Steampunk Madrid. But Mexican style, which should be interesting. Page created in 0.644 seconds with 15 queries.